After years of speculation and rumor, Nintendo finally makes a re-release of the sequel to Ocarina of Time a reality. That’s right: The Legend of Zelda: Majora’s Mask 3D is officially a thing. 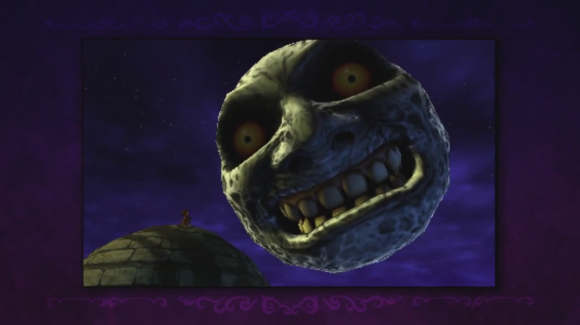 If you can look at this moon without getting nightmares, then you obviously never owned a Nintendo 64. Yes, the moon is still creepy as all get out. Like with its predecessor, the remastered version of The Legend of Zelda: Majora’s Mask brings a number of enhancements to the table, only the least of which are the enhanced visuals evident in the trailer. If Ocarina of Time’s 3DS version is anything to go by, players can expect improved physics, tweaked puzzles to improve gameplay, new control options for the classic items, and the inclusion of a master quest to all be elements brought to the table this time around.